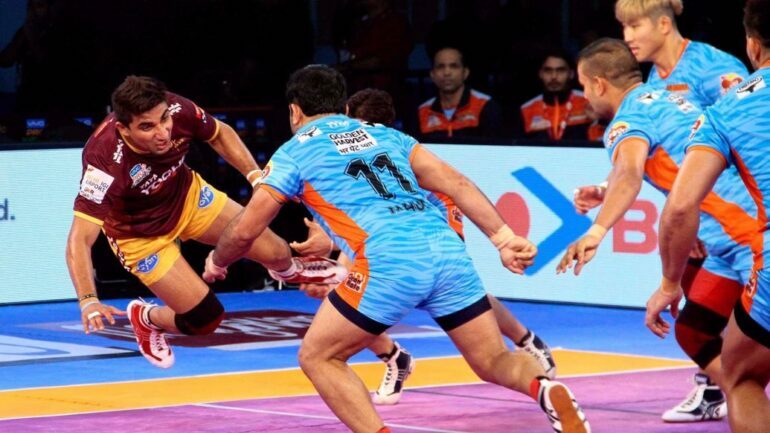 On the thirteenth day of Pro Kabaddi League season 6, the first match of the day was U. P. Yoddha vs Bengal Warriors. As this season know Bengal Warriors won all their two matches, another side U. P. Yoddha won one match and lost three matches out of four matches in zone B.
U.P. Yoddha won the toss and selected the choice of court. Warriors’ Jang Kun Lee raid two times and repeating the first raid and with this in three-minute score 0-4 on the table. 6-6, 7-7, 8-8, 12-12 score before halftime show strength and brilliant performance of the team. At halftime U. P. Yoddha lead with 3 points against Bengal Warriors with score 18-15 on the table. An unsuccessful raid from Rakesh Narwal and with this Bengal Warriors was all out trailed by three points. From 27-18 to 32-32 score and with this U. P. Yoddha was all out at last 10-minute match. What a comeback. 37-37, 38-38 and at end score 40-40, U. P. Yoddha hold Bengal Warriors to a thrilling tie. At last minute the last raid Prashanth Kumar with crucial bonus point helped to make a match in the tie. Both teams with three wins and one tie but U Mumba with two lost while Mumba didn’t taste lost. Puneri Paltan already tasted two lost in this season. U Mumba won the toss and selected choice of court. Paltan’s Nitin Tomar with successful raid and U Mumba all out with score 11-8 on the table. At halftime, Puneri Paltan leads with six points against U Mumba and score 17-11 on the table. Siddharth Desai ‘s brilliant Super Raid with four-point Puneri Paltan all out with score 28-27 on the table. Before 63-second score 31-31 on the table, both teams got one-one raid, But Puneri Paltan beat U Mumba with score 33-32 on the table. PKL Day 14: Puneri Paltan 5th winning a combo of thrilling and competitive match & Dabang Delhi 2nd win.